Mannequin heads are shoved together along floor-to-ceiling shelves, adorned with florescent-colored wigs and sunken-faced masks. Racks of clothing go up to the rafters and snake around, filling in the space between stuffed boxes labeled with a Sharpie—handwritten notes spell out a decrease in prices and advise that all sales are final. The hodge-podge visual tells a story of a small local business that’s slowly been strained to closure: After 30 years, Costume Capers will be closing its doors at the end of this year’s Halloween season. 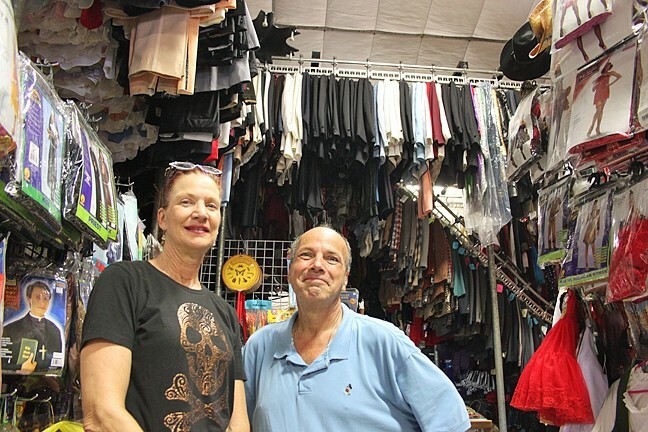 FOR A LIMITED TIME ONLY: Costume Caper’s co-owners Debi Hernandez and Keith Wetzel stand among the hundreds of costumes that they have rented out to customers and theatre companies over the years. After 30 years of business, the store will be closing in November, making this Halloween season their last. All inventory is on sale for at least 30 percent off, found at 2146 Parker Street. The service that Costume Capers provided for so long will likely only be appreciated once the dresses and hats are sold off or packed away and boxes are taped shut for good. What was this service? Year-round access to any sort of costume need, a need much more common than many might think. “We’re trying to sell a piece of history now,” said co-owner Keith Wetzel. This is your chance to get in on that history as they sell everything off. After opening in 1985, Costume Capers spent 23 years at its downtown Chorro Street location until the owners were asked to move out so the building could be seismically retrofitted. They relocated to Parker Street, and have since seen sales slowly dwindle. The decline was in part due to the loss of their downtown location—directly across the street from the Mission—where locals and tourists alike would often visit. “Everyone thought we went out of business, and we became more of a destination and not a walk-by location,” Wetzel said. Still, Wetzel said that a brick-and-mortar costume store in San Luis Obispo offered shoppers last-minute options for certain events. While that brought in some business, there was another role that the outfit played for costume seekers: a vital service for the local theater community. The owners found that while there could be slow retail seasons, there were enough theater productions and specialty needs on the Central Coast to keep them in business. They rented out a wide range of costumes to theater companies, to schools for plays and projects (think Colonial outfits), and for parties thrown by Cal Poly Greek organizations. Over the years, Costume Capers has supplied specialty costumes and makeup for the Great American Melodrama in Oceano and make-up classes for PCPA Pacific Conservatory Theatre and theatre arts programs at Cal Poly. Local junior high and high schools were among the perennial rental customers that relied on Costume Capers’ resourcefulness, and, at times, generosity. Time and time again, Costume Capers helped schools like Laguna fill a tall order when costuming their shows. Without such a service, it’s unclear how schools and other theater groups will manage without the authenticity supplied by both the costumes and knowledge of owners Wetzel and Debi Hernandez. Many factors led to the closure of this business, the owners said, attributing much of it to a dwindling customer base. The decrease in local rental-generating traditions, like the city’s once-festive (and wild) Mardi Gras celebrations, musical theater arts classes at Cuesta College, and others paired with an increase in online shopping. Costume Capers existed and thrived upon word of mouth. Even without much of an Internet presence, thanks to reputation and friends in the theater world, the shop was still able to supply costumes for productions in places like New York City and Tulsa, Okla. Now, however, things are different. “As technology progressed, we didn’t,” Wetzel said with a sigh. Working with specialty costumes, one-of-a-kind—and only one-of-that-kind—items as Costume Capers offers, doesn’t make for an easily operable, Internet-based rental service, Hernandez added. In turn, Hernandez said that because of the current trend toward one-time-use costumes and the improved quality of those costumes—all available from the Internet or the seasonal pop-up Halloween shops—rentals make up much less of Costume Capers’ business now than in the past. The simple fact that Costume Capers served as a year-round rental facility for many local theater productions leaves a question of whether its absence will leave a void—pop-up shops are only around temporarily, and the Internet doesn’t always have all the answers to costume needs. Wetzel and Hernandez opened Costume Capers with the intention of being a place where nicer, better-made, more-detailed costumes for children and adults could be rented or purchased. The shop evolved into something larger, beyond just outfits, and into valuable human capital as consultants. Now, they hope their loyal costumers can come buy some of those costumes, even if they are kept in the closet as relics of a different time. “We are trying to reach out to the people who have been customers for years and encourage them to buy costumes so that [the costumes] stay in the community,” Hernandez said. Some have rediscovered items that they had already found before. One past rental customer came back to find the suit that he had rented for his wedding, and, because it still fit, he bought it. “People are revisiting what they loved and wore,” Hernandez said. Actors have been coming by, buying what fit them well in the past, reinforcing both memories and the relevance of such a shop. Though sadness is evident in the closing of such a community-integrated shop, Wetzel and Hernandez remain grateful.